Plumtree Church is one of several ancient churches in this area. In its early days Plumtree was an important mother church whose influence spread over a considerable area, probably including villages as far away as West Leake. Although there was almost certainly a church here in the 11th Century, before the Norman Conquest, a claim that it was founded in the 9th century cannot be confirmed. The church is mentioned in the Domesday Book (1086). Saxon foundations were discovered when the tower wall was being rebuilt in 1906–7, and the blank arcading on the outside of the south wall of the tower is considered to date from the early 11th Century, along with parts of the doorway in the west wall. The nave has 13th Century arcades, while the architecture of the clerestory, the south aisle and the chancel is Perpendicular, from the late 15th Century. The north aisle also originally dated from the 13th Century but was rebuilt and much enlarged in 1873, partly using stone taken from the old Trent Bridge in Nottingham. The church was closed between 1873 and 1875 while a major redesign was carried out by George Frederick Bodley, one of the major Victorian architects, and his partner Thomas Garner. The project also involved raising the chancel arch and walls, putting in a new east window, moving the old one to the east end of the north aisle, putting new pews in the nave, removing the west gallery, reflooring the whole church, adding a new font and installing stalls for the clergy and choir in the chancel. The Rector at the time, Revd William Burnside, and his family paid for much of the work. The Bodley and Garner ceilings and screen were extensively renovated in the 1980s. The colours have been matched to those used in the 1870s. See Restoration Project (on the Plumtree Village website) for a report on the restoration. 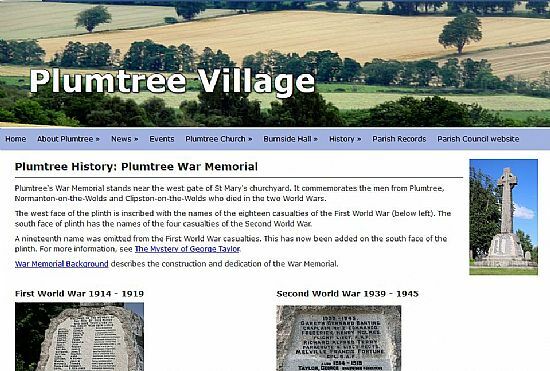 Historical information about Plumtree village, including reports of Harvest Festival services taken from old newspapers, annotated with background information about the leading figures in attendance; details of the dedication of the Johnson window; descriptions of some interesting Plumtree characters and full details of the men listed on the war memorial, including headstone photos and census entries. See the History section of the website. 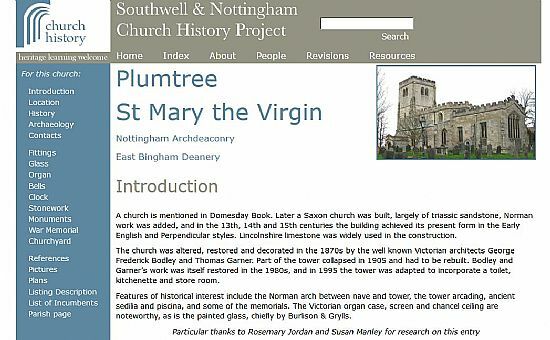 The Southwell and Nottingham Church History Project contains information on the history and architecture of Plumtree Church. 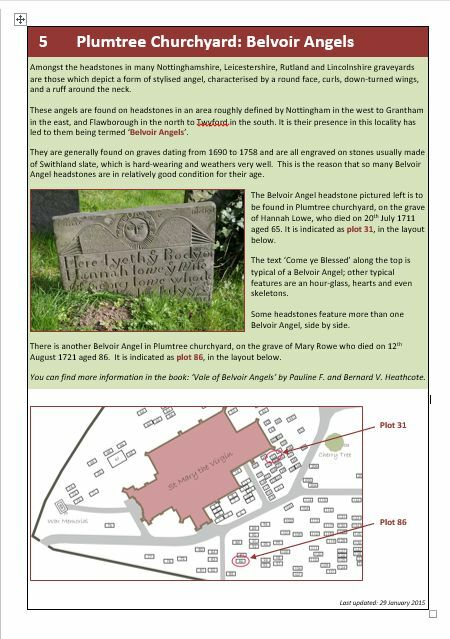 The Church History Project was set up in 1998 in conjunction with the University of Nottingham to provide an accurate historical and archaeological record for each church and church site within the Diocese. The recent award of a Heritage Lottery Grant has enabled this work to expand into both education and tourism under the heading of the Open Churches Project. A detailed guide to the church containing colour photographs is available at the back of church, price £1.00. If you are unable to visit the church but would like a copy, please contact Rosemary Jordan. It contains an introduction to the history of the church, including the Bodley & Garner restoration in the 1870s, followed by a tour taking in the Norman arch, the tower, children's corner, the vestry with its (then uncleaned) original panelling, the organ case, main altar and reredos, candelabra, and stained glass. The tour continues outside the church and describes the Norman blank arcading, some important headstones and the War Memorial. Most parish churches have their interesting features, inside and outside the church, and in the churchyard. Plumtree church is no exception and many of its features are worthy of more than just a passing glance. To enable visitors to discover the 'hidden' St. Mary's, the church has produced a series of laminated Information Sheets which are displayed at the back of church. We encourage visitors to borrow these sheets and use them to learn about St. Mary's rich history. 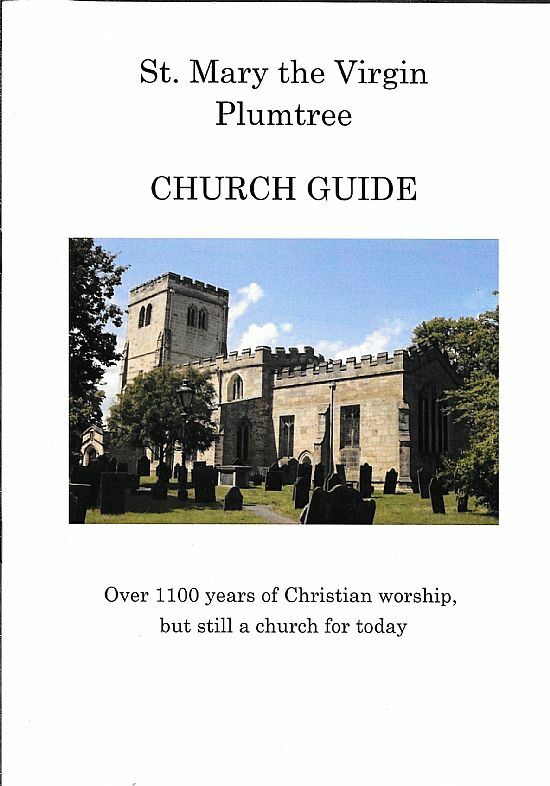 View the Information Sheets online to prepare for your visit to Plumtree's lovely church.